Google has not had any of its 85,000+ employees successfully phished on their work-related accounts since early 2017, when it began requiring all employees to use physical Security Keys in place of passwords and one-time codes, the company told KrebsOnSecurity. 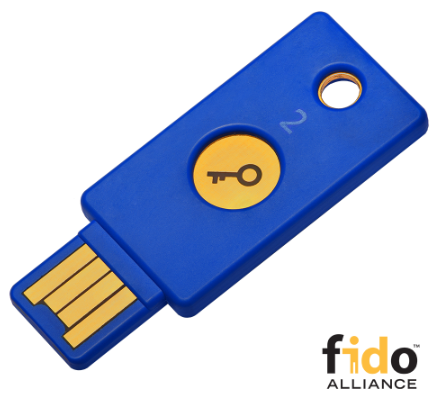 A YubiKey Security Key made by Yubico. The basic model featured here retails for $20. Security Keys are inexpensive USB-based devices that offer an alternative approach to two-factor authentication (2FA), which requires the user to log in to a Web site using something they know (the password) and something they have (e.g., a mobile device). A Google spokesperson said Security Keys now form the basis of all account access at Google. The basic idea behind two-factor authentication is that even if thieves manage to phish or steal your password, they still cannot log in to your account unless they also hack or possess that second factor. The most common forms of 2FA require the user to supplement a password with a one-time code sent to their mobile device via text message or an app. Indeed, prior to 2017 Google employees also relied on one-time codes generated by a mobile app — Google Authenticator. In contrast, a Security Key implements a form of multi-factor authentication known as Universal 2nd Factor (U2F), which allows the user to complete the login process simply by inserting the USB device and pressing a button on the device. The key works without the need for any special software drivers. Once a device is enrolled for a specific Web site that supports Security Keys, the user no longer needs to enter their password at that site (unless they try to access the same account from a different device, in which case it will ask the user to insert their key). U2F is an emerging open source authentication standard, and as such only a handful of high-profile sites currently support it, including Dropbox, Facebook, Github (and of course Google’s various services). Most major password managers also now support U2F, including Dashlane, and Keepass. Duo Security [full disclosure: an advertiser on this site] also can be set up to work with U2F. With any luck, more sites soon will begin incorporating the Web Authentication API — also known as “WebAuthn” — a standard put forth by the World Wide Web Consortium in collaboration with the FIDO Alliance. The beauty of WebAuthn is that it eliminates the need for users to constantly type in their passwords, which negates the threat from common password-stealing methods like phishing and man-in-the-middle attacks. It’s Nov. 14 — the second Tuesday of the month (a.k.a. “Patch Tuesday) — and Adobe and Microsoft have issued gobs of security updates for their software. Microsoft’s 11 patch bundles fix more than four-dozen security holes in various Windows versions and Office products — including at least four serious flaws that were publicly disclosed prior to today. Meanwhile, Adobe’s got security updates available for a slew of titles, including Flash Player, Photoshop, Reader and Shockwave. Four of the vulnerabilities Microsoft fixed today have public exploits, but they do not appear to be used in any active malware campaigns, according to Gill Langston at security vendor Qualys. Perhaps the two most serious flaws likely to impact Windows end users involve vulnerabilities in Microsoft browsers Internet Explorer and Edge. It’s Patch Tuesday, again. That is, if you run Microsoft Windows or Adobe products. Microsoft issued a dozen patch bundles to fix at least 54 security flaws in Windows and associated software. 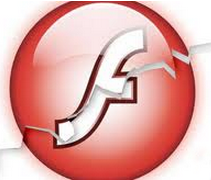 Separately, Adobe’s got a new version of its Flash Player available that addresses at least three vulnerabilities. The updates from Microsoft concern many of the usual program groups that seem to need monthly security fixes, including Windows, Internet Explorer, Edge, Office, .NET Framework and Exchange. 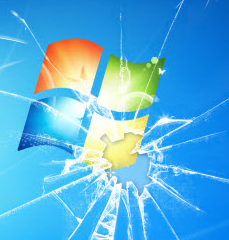 According to security firm Qualys, the Windows update that is most urgent for enterprises tackles a critical bug in the Windows Search Service that could be exploited remotely via the SMB file-sharing service built into both Windows workstations and servers. Qualys says the issue affects Windows Server 2016, 2012, 2008 R2, 2008 as well as desktop systems like Windows 10, 7 and 8.1. “While this vulnerability can leverage SMB as an attack vector, this is not a vulnerability in SMB itself, and is not related to the recent SMB vulnerabilities leveraged by EternalBlue, WannaCry, and Petya.” Qualys notes, referring to the recent rash of ransomware attacks which leveraged similar vulnerabilities. Other critical fixes of note in this month’s release from Microsoft include at least three vulnerabilities in Microsoft’s built-in browser — Edge or Internet Explorer depending on your version of Windows. There are at least three serious flaws in these browsers that were publicly detailed prior to today’s release, suggesting that malicious hackers may have had some advance notice on figuring out how to exploit these weaknesses. As it is accustomed to doing on Microsoft’s Patch Tuesday, Adobe released a new version of its Flash Player browser plugin that addresses a trio of flaws in that program. Microsoft today released security updates to fix almost a hundred flaws in its various Windows operating systems and related software. One bug is so serious that Microsoft is issuing patches for it on Windows XP and other operating systems the company no longer officially supports. Separately, Adobe has pushed critical updates for its Flash and Shockwave players, two programs most users would probably be better off without. According to security firm Qualys, 27 of the 94 security holes Microsoft patches with today’s release can be exploited remotely by malware or miscreants to seize complete control over vulnerable systems with little or no interaction on the part of the user. Microsoft this month is fixing another serious flaw (CVE-2017-8543) present in most versions of Windows that resides in the feature of the operating system which handles file and printer sharing (also known as “Server Message Block” or the SMB service). SMB vulnerabilities can be extremely dangerous if left unpatched on a local (internal) corporate network. That’s because a single piece of malware that exploits this SMB flaw within a network could be used to replicate itself to all vulnerable systems very quickly. It is this very “wormlike” capability — a flaw in Microsoft’s SMB service — that was harnessed for spreading by WannaCry, the global ransomware contagion last month that held files for ransom at countless organizations and shut down at least 16 hospitals in the United Kingdom. According to Microsoft, this newer SMB flaw is already being exploited in the wild. The vulnerability affects Windows Server 2016, 2012, 2008 as well as desktop systems like Windows 10, 7 and 8.1. The SMB flaw — like the one that WannaCry leveraged — also affects older, unsupported versions of Windows such as Windows XP and Windows Server 2003. And, as with that SMB flaw, Microsoft has made the unusual decision to make fixes for this newer SMB bug available for those older versions. Users running XP or Server 2003 can get the update for this flaw here. “Our decision today to release these security updates for platforms not in extended support should not be viewed as a departure from our standard servicing policies,” wrote Eric Doerr, general manager of Microsoft’s Security Response Center. Adobe and Microsoft today each issued updates to fix critical security flaws in their products. Adobe’s got fixes for Acrobat and Flash Player ready. Microsoft’s patch bundle for October includes fixes for at least five separate “zero-day” vulnerabilities — dangerous flaws that attackers were already exploiting prior to today’s patch release. Also notable this month is that Microsoft is changing how it deploys security updates, removing the ability for Windows users to pick and choose which individual patches to install. Zero-day vulnerabilities describe flaws that even the makers of the targeted software don’t know about before they start seeing the flaws exploited in the wild, meaning the vendor has “zero days” to fix the bugs. According to security vendor Qualys, Patch Tuesday updates fix zero-day bugs in Internet Explorer and Edge — the default browsers on different versions of Windows. MS16-121 addresses a zero-day in Microsoft Office. Another zero-day flaw affects GDI+ — a graphics component built into Windows that can be exploitable through the browser. The final zero-day is present in the Internet Messaging component of Windows. Starting this month, home and business Windows users will no longer be able to pick and choose which updates to install and which to leave for another time. For example, I’ve often advised home users to hold off on installing .NET updates until all other patches for the month are applied — reasoning that .NET updates are very large and in my experience have frequently been found to be the source of problems when applying huge numbers of patches simultaneously. Microsoft’s patch policy changes are slightly different for home versus business customers. Consumers on Windows 7 Service Pack 1 and Windows 8.1 will henceforth receive what Redmond is calling a “Monthly Rollup,” which addresses both security issues and reliability issues in a single update. The “Security-only updates” option — intended for enterprises and not available via Windows Update — will only include new security patches that are released for that month. Adobe has pushed out a critical update to plug at least 52 security holes in its widely-used Flash Player browser plugin, and another update to patch holes in Adobe Reader. Separately, Microsoft released 11 security updates to fix vulnerabilities more than 40 flaws in Windows and related software. First off, if you have Adobe Flash Player installed and haven’t yet hobbled this insecure program so that it runs only when you want it to, you are playing with fire. It’s bad enough that hackers are constantly finding and exploiting zero-day flaws in Flash Player before Adobe even knows about the bugs. The bigger issue is that Flash is an extremely powerful program that runs inside the browser, which means users can compromise their computer just by browsing to a hacked or malicious site that targets unpatched Flash flaws. The smartest option is probably to ditch this insecure program once and for all and significantly increase the security of your system in the process. I’ve got more on that approach — as well as slightly less radical solutions — in A Month Without Adobe Flash Player. If you choose to update, please do it today. The most recent versions of Flash should be available from this Flash distribution page or the Flash home page. Windows users who browse the Web with anything other than Internet Explorer may need to apply this patch twice, once with IE and again using the alternative browser (Firefox, Opera, e.g.). Chrome and IE should auto-install the latest Flash version on browser restart. Microsoft today pushed out 13 security updates to fix at least 39 separate vulnerabilities in its various Windows operating systems and software. Five of the updates fix flaws that allow hackers or malware to break into vulnerable systems without any help from the user, save for perhaps visiting a hacked Web site. The bulk of the security holes plugged in this month’s Patch Tuesday reside in either Internet Explorer or in Microsoft’s flagship browser — Edge. As security firm Shavlik notes, Microsoft’s claim that Edge is more secure than IE seems to be holding out, albeit not by much. So far this year, Shavlik found, Edge has required 19 fixes versus IE’s 27. Windows users who get online with a non-Microsoft browser still need to get their patches on: Ten of the updates affect Windows — including three other critical updates from Microsoft. As always, Qualys has a readable post about the rest of the Microsoft patches. If you experience any issues with the Windows patches, please share your experience in the comments below. As it is known to do on patch Tuesday, Adobe issued security updates for its Reader and Acrobat software. Alas, there appears to be no update for Adobe’s Flash Player plugin as per usual on Patch Tuesday. However, an Adobe spokesperson told KrebsOnSecurity that the company will be issuing a Flash Player update on Thursday morning.